For Christmas, my children received an interesting gift: a Crayola Crayon Maker. It’s a cute little device. All you do is break up some crayons (they come with the crayon maker) and put them on a little tray in there, flip on the switch, and wait for a bit. The crayons melt, then you tip the tray over and the melted wax pours into some crayon molds. Wait a few minutes and you have new multicolored crayons! It was one of those toys that my children had a lot of fun with for one day, then it got set aside and hasn’t really been thought about since. However, the core idea behind it is something that can really be of use to frugal families where the children are really into drawing and art. At the bottom of our crayon bucket, you’ll find a lot of nubs. These little mostly-used crayons are now short enough that our children’s fingers don’t hold them very well. Often, the nubs are the result of accidental crayon breakage; other times, the crayons are short due to wear and tear. These stubs might get thrown out at some houses, but at our house, they’re a perfect item for recycling. We just take out a silicone mold we found at a garage sale for a quarter (like this one), break up the nubs into tiny pieces, and fill up the mold with the pieces. Then, we pop the mold in the oven at a fairly low temperature – say 200 F – and leave it in there for fifteen minutes. We often do this alongside something that’s baking for other reasons. The melting point of crayon wax seems to be around 130 to 150 F depending on the color, so 200 F is a great temperature for the crayons to melt together in the mold. When they’re done, just put the mold out on the table and leave it there until the crayons are room temperature, then pop them out of the mold. If needed, you can carefully cut the new “crayons” into smaller shapes that are easier for drawing. This gives the children very interesting swirled crayons to use, costs us virtually nothing, and enables us to put those crayon stubs to good use. That’s a win all around. On top of that, this is a perfect lesson for the children about recycling and reusing things. There’s no reason to throw something away if there’s still a perfectly good use for it, after all. In fact, we’ve actually taken a big pile of crayon stubs from the children of friends who were happy to hand them over at first, until we explained what we were going to do with them. They then seemed to change their minds a bit, thinking that it seemed like a pretty nifty thing to do with their kids. If you’ve got kids and crayon stubs and if you have access to a silicon mold of some sort, give this a try. 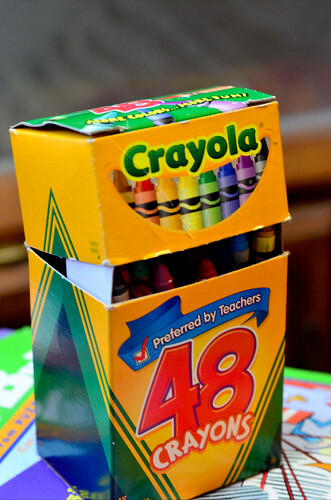 It’s easy, demonstrates recycling, costs almost nothing, and results in some cool crayons for your children.